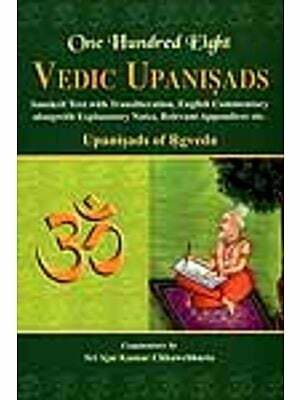 The revised edition of the successful and popular translation of the Thirty Minor Upanisads brings together for the first time, the lesser known Vedanta and Yoga Upanisads. These works are a vast compendium of doctrines found in early Vedic literature as well as later sectarian theistic traditions. The new edition endeavours to strike a balance between a faithful exposition of the original text and a sensitive reflection on the central doctrines that embody humanity's perennial quest for knowledge and liberation. Combining scholarship and philosophical interpretation the work retains every gradation and nuance of the philosophical and experiential aspects of Hindu faith. The book is an invaluable resource for religion scholars and students of South Asia's diverse faiths and cultures, and all who seek to understand the spiritual heritage of India. 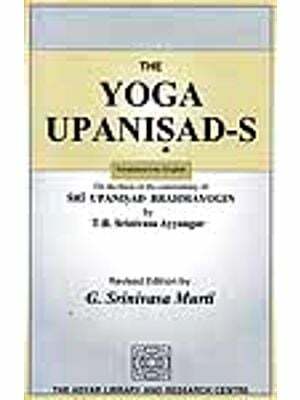 The new, revised edition of this popular and successful translation of the Thirty Minor Upanisads by E Narayanaswami Ayiar brings together, for the first time, the lesser known and much negelected set of Thirty Minor Upanisads probably compiled during the medieval and post medieval periods. These texts, despite their late origin are still inspiring scholars and laypersons as they have for the last ten centuries. The Minor Upanisads are divided into these groups. The first fourteen fall under the heading of Vedanta Upanisads; the small group of two Upanisads explore, psycho-physical subjects. The third groups comprise the fourteen Yoga Upanisads. The book offers revealing insights into the fundamental themes: contemplations on the Reality, the unity of atman and Brahman; the attitude and qualifications of the worldly adepts and sages; steps leading to the mastery of the body and control over senses, esoteric details on the Yoga, and symbolic structures of the subtle body. The engaging Introduction explores seminal core principles of the Vedantic faith and highlights the necessity of the experiential dimension of spiritual experience that these texts afford. The eclectic collection is as invaluable resource for scholars and students of South Asia's diverse and fascinating faiths. Madhu Khanna is Professor in Religious Studies and Director of the Centre for the Study of Comparive Religion & Civilizations, Jamia Millia Islamia University. She earned her PhD in Religious/Indic Studies from Wolfson College, Oxford University in 1986, with a specialization in Hindu Tantra. Author of several books and academic papers, her publications include, among others, Sakta Pramoda of Deva Nandan Singh, (edited with an Introduction in English in two volumes); The Subtle Body: An Illuminated Tantric Scroll, Commentary with Notes and Translation; Rta -The Cosmic Order, Proceedings of an International Seminar (editor); Yantra: The Tantric Symbol of Cosmic Unity, published by Thames and Hudson, London, with American, German and Italian editions. Her seminal publication, The Sricakra: History, Ritual end Symbol of Goddess Tripurasundari based on Sanskrit manuscript sources is forthcoming. She was awarded the Homi Bhabha Fellowship in 1991-1993 to research her project, "Indian Goddess and Feminist Consciousness". She has also researched and coordinated six major interdisciplinary cross-cultural exhibitions, and was conferred the Mahavir Mahatma Award by Times Foundation for the "Eternal Gandhi" Multimedia Museum Exhibit. She is also the founding member and trustee of the Tantra Foundation, New Delhi. The Upanisads undoubtedly represent a high watermark of world wisdom, and remain a perennial source of inspiration and guidance down to the present day. The fact that they deal with perennial questions such as the relationship of the Atman and Brahman (man and God in the Semitic tradition), the several pathways to the union (yoga) of the two, the importance of the Guru and the essential requirements of being a worthy student are of perennial significance, and retain their importance age after age down through the long and tortuous corridors of time. Reading the words of inspired sages is, for me, one of the great joys of life. 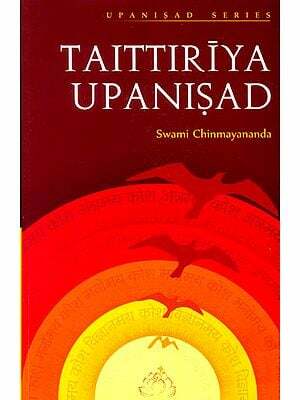 In memorable words, the Upanisads reveal to us a world of spiritual striving and realization, a world to which all human beings can have access regardless of their caste or creed, religion or nationality. It is for this reason that the Upanisads have had such a profound influence around the world. We may recall Schopenhauer's much quoted remarks: "From every sentence deep original and sublime thoughts arise, and the whole is pervaded by a high and holy and earnest spirit. In the whole world ... there is no study ... so beneficial and so elevating as that of the Upanisads. They have been the consolation of my life, and will be the consolation of my death. They are destined sooner or later to become the faith of the people." 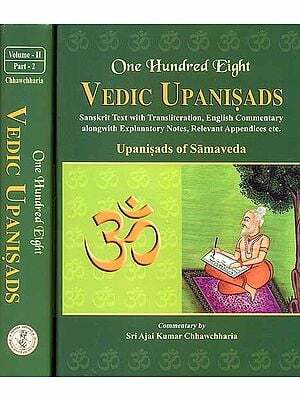 It is not known exactly how many Upanisads existed, but it is believed that the number was well over 200. Of these the great Adi Shankaracharya wrote commentaries on 11 of them, which have therefore been looked upon as the major Upanisads. 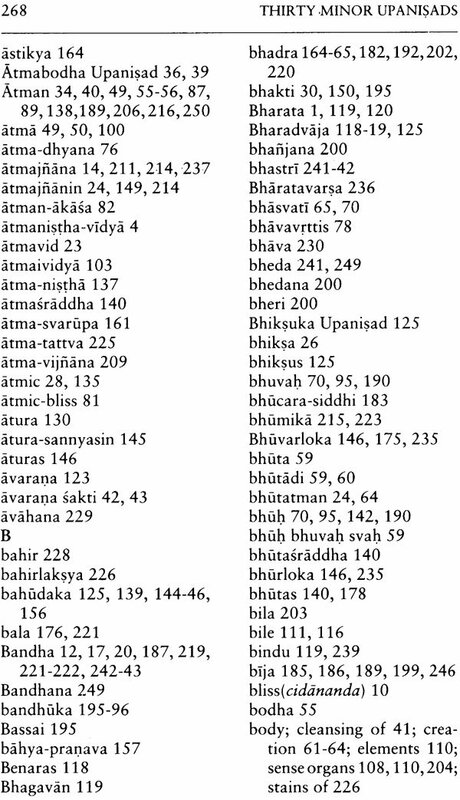 These are the Isa, Kena, Katha, Prasna, Mundaka, Mandukya, Taittiriya, Aitareya, Chandogya, Brhadaranyaka and Svetasvatara. In addition, there are several other Upanisads which, somewhat unjustly, have been labelled as 'minor'. They may not have attracted so much attention, but the truths that they contain are no less significant than those in the major ones. It is, therefore, useful that some of the 'minor' Upanisads also become available to lovers of philosophy. In the context I welcome the publication of 'Thirty Minor Upanisads' which were translated by Shri K. Narayanaswami Aiyar almost a century ago and reedited and updated by Prof. Madhu Khanna, a well known scholar. They carry an erudite introduction by Swami Veda Bharati, a reputed Vedantic scholar. In the complex and convoluted world in which we live, full of conflict and tension, the study of the Upanisads represent a gateway of a different reality illuminated by spiritual truths. I am sure this publication will help to popularize the comparatively lesser known texts, and thereby prove to be of help not only to scholars but to spiritual seekers in India and abroad. It is said to be perennial and yet today it is again new. The days and nights appear each in the same form as any other. It is simply impossible to determine the age and date of the composition of the Minor Upanisads of which there are over 200 to be found in the published compendiums, not to include the yet unpublished ones. Furthermore, it is not possible to determine as to what exactly makes a text worthy of the title 'Upanisad'. The aupanisadika chapter of Kautalya's Arthashastra (14.1.1) gives prescriptions for secret weapons such as poisonous gases to be used in the battles. 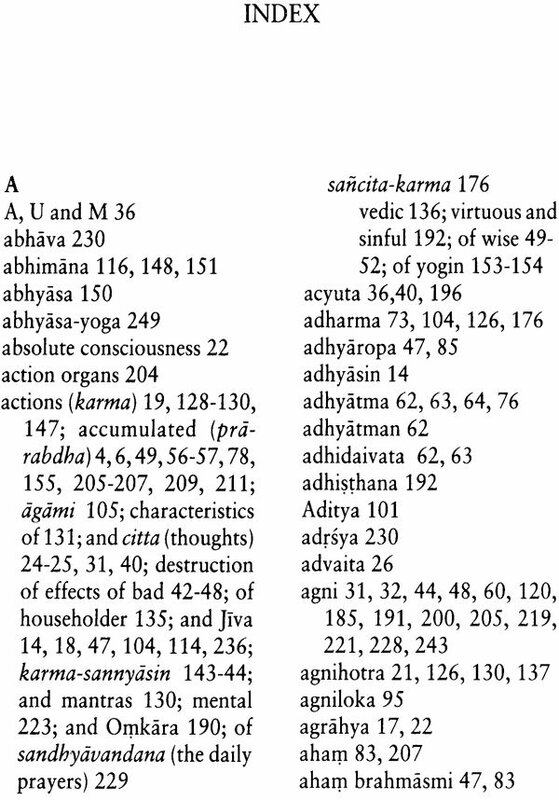 Vatsyayana's Kama-sutra similarly has an 'Upanisadic' chapter (7.1-51, 2.1-59). The Bhagavadgita, a spiritual text par excellence, is completely different from all other Upanisads in style and language. 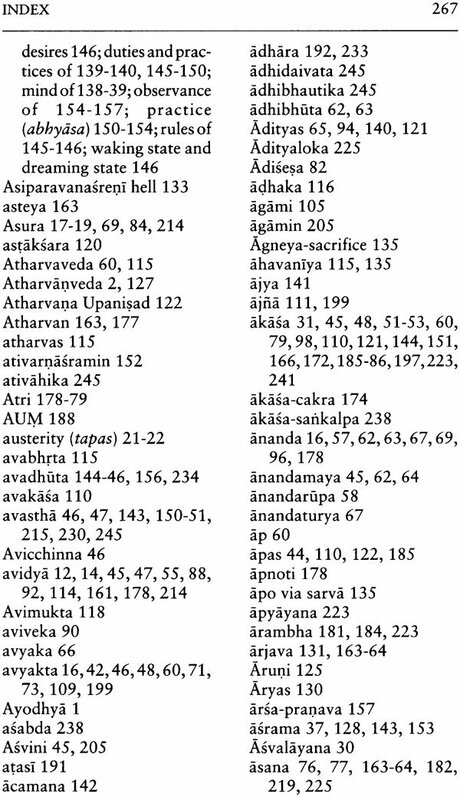 Many Upanisads are independent compositions, yet others are fragments some with variants-of larger texts. The Brhad- aranyaka Upanisad is simply the fourteenth Section of the Satapatha Brahmana. The correct title of the Bhagavad Gita is Bhagavad Gita Upanisads (in plural), and it is a small part of the great epic Mahabharata. Furthermore, when we look at the subject matter of the Upanisads, major and minor, only a few have their contents organized in some kind of a logical sequence. Prasna Upanisad answers six questions on prana in sequence. Svetasvatara begins by asking five or six questions in the first verse and giving seven propositions about reality in the second. But, thereafter it breaks into verses that seem to be extemporaneously organized as to their topics. It would be a gigantic task to take all the over 200 Upanisads and organize them in any logical sequence of their age, language, style or subject matter with regard to their relationship with one another, and with regard to the subject matter internally. Not only the titles, but even the dates of the Upanisads are hotly debated. 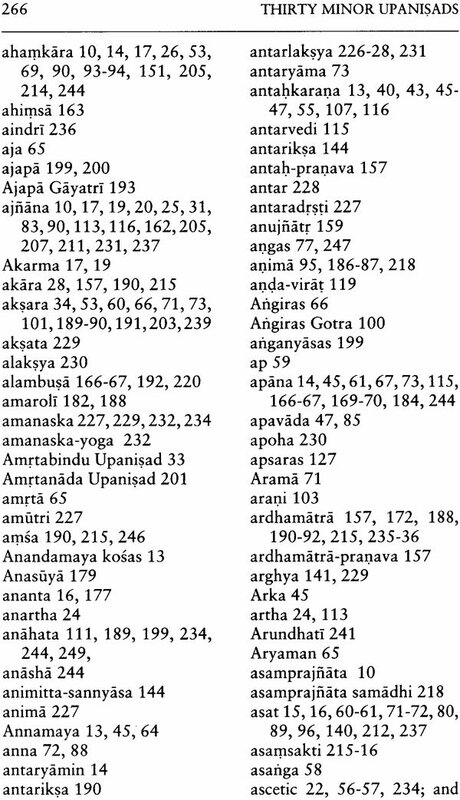 The relative ages of each of the Upanisads can not be systematically evaluated. Although, at the face of it each Upanisad may appear as a reasonably homogeneous textual unit a closer textual analysis reflects a "more complicated histories of composition, with textual additions at various time periods adding new prospectus and ideas to these important texts".' The Upanisads constitute a "fluid textual genre" Some older Upanisads incorporate parts of larger texts, others like the Katha, Munduka, are self- contained. 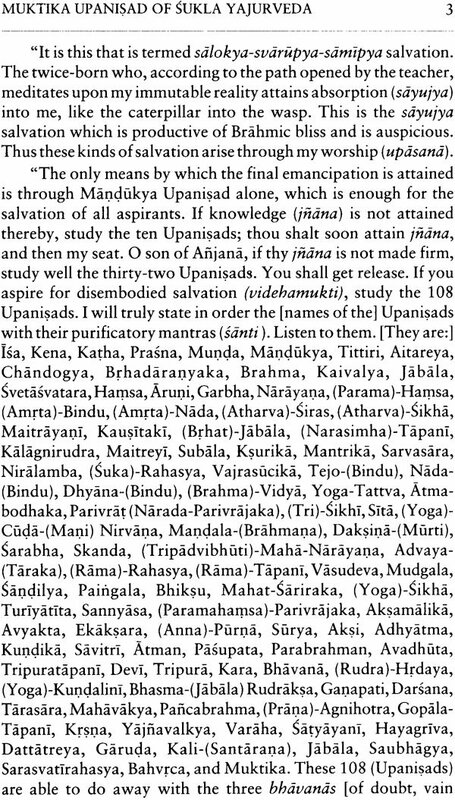 The classical eleven Upanisads are quoted from Sankaracarya. The classical idea of the identity of Brahman and atman have been interpreted throughout the medieval periods, down to the modern times. The Minor Upanisads were composed sometime between the medieval and post medieval period. Culled from the Arnaya portion of the Vedas, these Upanisads are so called because they were studied in the forest dwellings of the sages, by the renunciate who had given up the life of a householder. The Thirty Minor Upanisads translated here broadly fall into three groups. 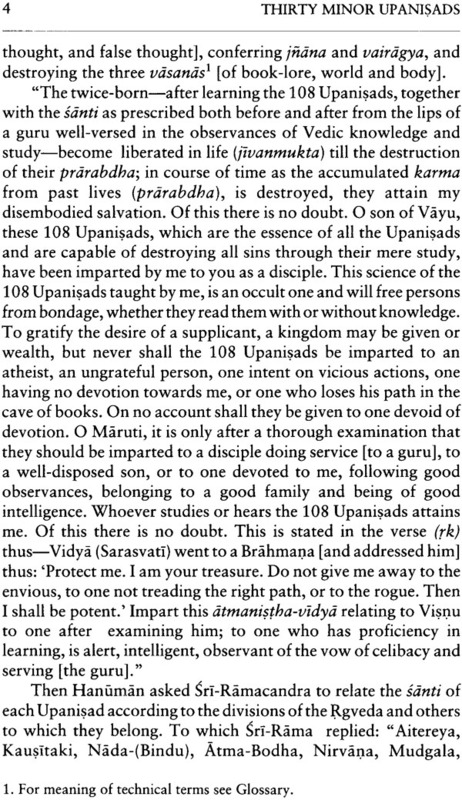 The first fourteen fall under the heading of Vedanta Upanisads. The second group falls under psychophysical Upanisads as they deal with the esoteric aspects of the physical and subtle body. The last group comprising fourteen are the Yoga Upanisads. 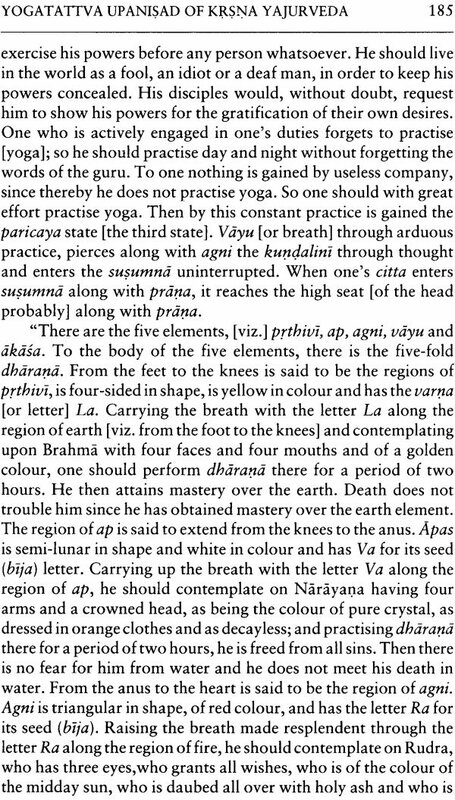 The ancient sages had proclaimed that the worthy adept (adhikari) had to satisfy the preceptor to some degree about the four means (sadhana-catusataya). He had to be convinced about the truth of the identity of atman and Brahman, be free of the ephemerality of the world; he should be indifferent to material life, and finally, must have fair mastery over the body, and firm control upon the fluctuations of the mind. The Thirty Minor Upanisads touch on all these aspects and are not so minor at all. The scholars try to apply their linguistic and other tools to determine the exact authors and dates of scriptural texts. A seeker of spiritual knowledge is neutral to this delving. He/she seeks an inner truth that will guide his/her life towards becoming yet another channel for revealing the perennial knowledge. Hence we shall avoid here the temptation to get into the scholarly missions as to the dates and authors and such of the Upanisads. Scholarship alone will often speculate but will not be able to give a final satisfactory solution to the problems of textual analysis of the Upanisads. All we can do is resort to the traditions passed on by the yogis whose texts these truly are. When a preceptor of the states of consciousness is in samadhi, the knowledge comes bubbling up in his/her ocean of fullness. It has its own internal sequence not commonly visible on the surface. It will take a major volume to attempt to unravel the mystery of the intuitive sequences of thought patterns presented in the texts. We had better not attempt that here. When one reads inspired texts, certain sections and statements draw our attention, according to the quest of our individual spirit, and the particular purification or guidance needed at a given level of our spiritual development. Other texts and segments, however deep, simply may not attract our attention at that time. It seems probable that this might have been the factor in the translator K. Narayanaswami Aiyar's choice of the thirty out of 200. Similarly, the sequence of the thirty is arbitrary and does not conform to the one seen in the published compendia. For example, the Muktika Upanisad is the last in the Section of one of the collections published by Motilal Banarasidass', but the author has it as the first in the translation of his selections. The Muktika Upanisad contains the lists of 108 Upanisads, each one's affiliation with a specific Veda, and the importance of studying these. 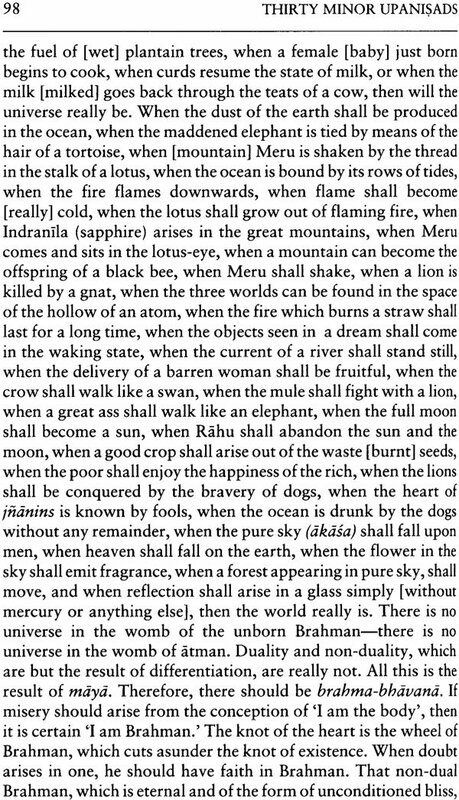 In the tradition of Sanskrit classics such information normally comes at the end. But Shri Aiyar has chosen to reverse this custom. After stating six questions about twenty-three categories of reality, the Upanisad then proceeds to answer all the questions in four long paragraphs. Shri Aiyar does not follow that sequence. He states one question at a time and pulls out from the Sarvasara Upanisad the appropriate answer. It makes for an easier reading. This device does no violence to the text but the reader may need to remind himself that the translation does not reflect the original text exactly even though his device makes the text more accessible to an average reader. Translating is a complex task, (a) a three-line paragraph in Sanskrit may require six or more long ones in English; (b) the multilaterality of the meanings of words may need attention, for example, apoha; (c) the verb root meanings (yaugika) become concealed under the thick layer of the conventional meaning (rudhi). These need to be unravelled for example, the word parmesthin in the verse quoted below. (d) The poetic conventions and prosodial form of Sanskrit get lost in the thick English prose unless we make a diligent effort to present the original poetic value. (e) The experiential knowledge gets lost in the hands of the grammarian if he has not had the relevant spiritual experience to which the text is referring. Much of English translation of Sanskrit poetic works suffers from these deficiencies.